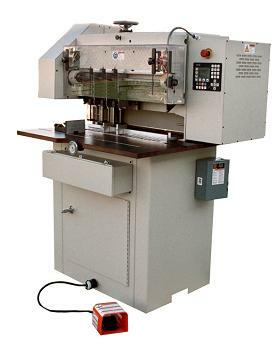 Our Model M Drill combines our industry leading 3" lift capacity with a host of standard features not found on other paper drill machines, such as fixed table construction, micrometer side gauge, easy operatior adjustment of drill heads and electronic display. This machine also comes standard with see-through interlock guards, emergency stop button and a pneumatic braking system. Right and left heads - 1-1/4"
2 right or 2 left - 1-1/2"
Maximum center to center - 26"
Maximum lift height - 3"
Back gauge depth - 9"
Headrail Motor - 1-1/2 H.P. Spindle Motor - 3 H.P. Drill Sizes - 1/8 " to 1/2"